With a partial government shutdown possible in just 10 days, President Donald Trump met with Republican leaders to hash out a spending plan that includes funding for Trump's proposed border wall with Mexico. Trump is seeking $5 billion for the wall, a centerpiece of his 2016 campaign, and is ratcheting up pressure on Congress to provide it. Trump said this month that it could be a "good time" for a shutdown if he doesn't receive the wall funding he wants. House Republicans approved $5 billion for Trump's wall in a key committee, but a bipartisan bill in the Senate allocates just $1.6 billion for the border. House Majority Whip Steve Scalise, R-La., took a hard line on the negotiations, saying Democrats will soon face a crucial question: "Are they going to shut down the government because they don't want to keep America safe?" 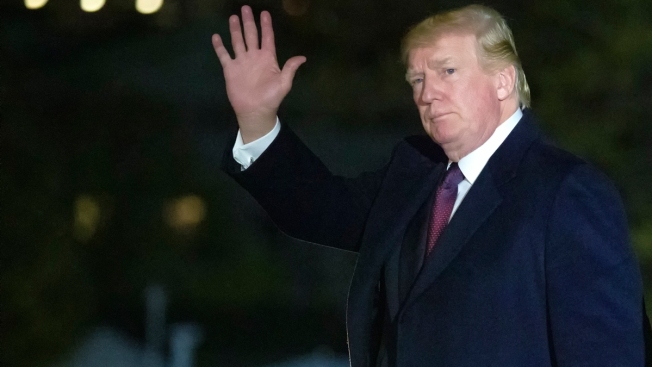 Trump said Tuesday he is considering a backup plan if Congress rejects his demand for the $5 billion, possibly including the continued use of troops and razor wire to prevent migrants from entering the country. Senate Minority Leader Chuck Schumer, D-N.Y., said the Trump administration hasn't even spent the $1.6 billion Congress approved in the current budget for the wall. With Republicans in control of the presidency, the House and the Senate, "a shutdown is on their back,'' Schumer said Tuesday. "Stick to the $1.6 billion." Democrats and GOP leaders struck a deal earlier this year to fund nearly three-fourths of the government into next year. Left undone, however, is funding for the Department of Homeland Security, which oversees the border, and a few other agencies. They're now running on stopgap funds set to expire Dec. 7. Complicating border negotiations, Democrats also want to protect special counsel Robert Mueller's investigation into Russian election interference and any possible coordination with Trump associates. McCarthy, whose party lost more than three dozen House seats in the midterm elections earlier this month, urged Democrats to work with Republicans on the wall and other legislation, including a long-stalled farm bill, a new tax cut package and criminal justice reform. White House spokesman Hogan Gidley said Trump and GOP leaders discussed a range of legislative priorities, including the California wildfires, the farm bill and ``the great need for border security at this crucial time,'' as well as prison reform and the budget. The group also talked about Monday's announcement by General Motors that it will shutter five plants and slash 14,000 jobs in North America, Gidley said. Doug Andres, a spokesman for House Speaker Paul Ryan, R-Wis., offered a similar list, saying that talks included "responsible funding for border security."